No Longer Available. Use Honeywell H6062A1000 as replacement. No longer avalable. Use Honeywell H6062A1000 as replacement. 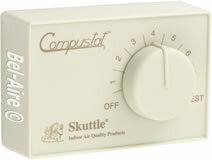 Skuttle SEH-7100-000 Compustat Automatic Humidistat with Temperature Sensor 24vac. While designed to operate automatically, it can also be installed for manual operation. Automatic adjustment of your home's relative humidity (RH) based on the outdoor temperature and your preferred level of comfort. Continuous protection of your home and furnishings against the damaging effects of dry or overly-humidified indoor air. Strong defense against "sick house" conditions that cause or aggravate allergies, colds, flu and respiratory aliments. Solid-state components for safer, more reliable operation. Out-of-the-way installation. Mounts on the return air duct; eliminates unsightly wall-mounting and the chore of fishing wires through walls. Worry-free operation. Just set it and forget it to maintain a constant, comfortable level of humidity throughout the heating season. Safety-conscious design. Does not intrude into the air duct; exposed materials and components are UV resistant. Optional manual installation to let you fine-tune indoor humidity at the turn of a dial.